They sell mats…and they do a dang good job of it. I wanted to buy some rubber mats for my workout room, and I stumbled upon We Sell Mats. …and I’m so glad that I did! First of all, the mats were less expensive than almost any other mats that I could find, and, secondly, the mats are very high quality! Now, I believe that those first two items should go without saying. What really set “We Sell Mats” apart from the competition was the fact that they went the extra mile with regard to customer service. You receive what you ordered . We Sell Mats sent me an e-mail with the following: “Thank you for your order and patience. When you placed your order Amazon had a ship date of 3/26/12. We are pleased to say the product arrived to our NC warehouse today and was shipped with Fedex today 8 days earlier than expected. You should have received an email thru Amazon with tracking information for your package.Please call or email if you need anything. Thank you for the opportunity to serve you. Now, this is a minor change to the usual process flow and it required no effort (or even attention) on my part, but my customer satisfaction went through the roof (to the point that I made this post about it)! I wasn’t thinking about the delivery date being ‘too far out’, but We Sell Mats went the extra mile to write to me and let me know that they exceeded expectations that I didn’t even know that I had; they demonstrated to me that they cared more about my order than I did! Big thumbs up to “We Sell Mats”. I highly recommend them if you ever need to purchase any mats for your workout room or for any other purpose! So, I have this dorky little hobby where I like to send companies my feedback on their products and suggest improvements. Now, I work at a large company, so I know that the process to implement a change is quite large and that customer feedback/suggestions rarely makes it back to the folks who are actually in charge of the product design (which is a larger problem entirely). I really don’t expect any changes because of my comments, but I am really curious to see what the company does with my suggestions and what feedback I get. That being said, I had a suggestion for Panasonic, so I went to their “contact us” page to submit my suggestion. First of all, it’s buried under “Product Support” option, which makes me feel like I have to have a defective product in order to write to them…not really conducive to sharing ideas! Now, I really don’t like these forms. I’d much rather send an e-mail from my personal e-mail account (I’m already familiar with how my e-mail system is set up, and, at the very least, then I have a copy for my records), but I understand why they do it this way (so they are sure they have all of the necessary information to respond appropriately). So I guess I have to live with what they give me. 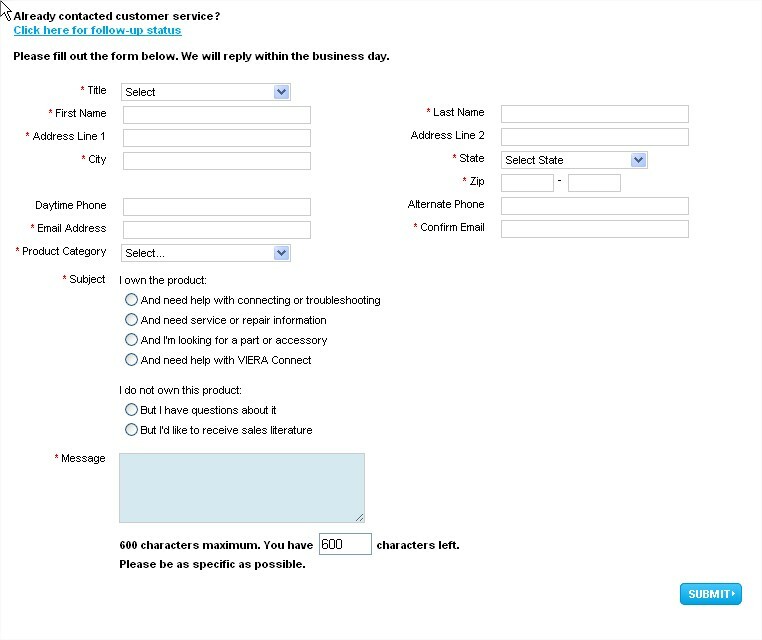 Again, though, I have to select from “I have the product [and have issues]” and “I don’t have the product [but I want more information]”. They really must not want my input/ideas!!! The biggest pet peeve on this site is the 600 word limit. Right from the start it makes me feel like I’m not worthy of their time (I’m only worthy of 600 words worth of their time, anyway). If I was already mad because my microwave burned down my house (hypothetical, of course), I’d be even more mad that you think I’m only worth 600 words!!! Yes, removing this would mean you’d get some long e-mails, but I think you would be providing better customer service by not making your customers feel unworthy to share their thoughts/issues with you! Finally, I received an automatic response e-mail saying that they’d respond to me within one business day; I received this e-mail over a month ago, and I have yet to receive a response (not even a “Thanks, but no thanks!”). Yet another lesson in “Don’t promise what you can’t deliver every single time”. Panasonic: Wag of the Finger to you.